One of the most important conversations in the history of the Meiji-era occurred on Aug 10, 1879. For two hours, former U.S. president and Civil War general Ulysses S Grant talked with Emperor Meiji (personal name: Mutsuhito) via a translator about the future of Japan. At the Nakajima Tea House in the Hama Rikyu Gardens, Grant acted as a mentor, providing the Emperor with some sound advice for those turbulent times. From June 21 to Sept 3, Ulysses S Grant, along with his wife Julia and 29-year-old son Frederick, learned a great deal about a country taking its first cautious steps toward becoming a modern industrialized nation. It had only been a decade since Japan had completed its own boshin senso, or civil war, which began a turbulent transition toward an imperial-led government, replacing the centuries-old samurai-led shogunate. Upon Grant's arrival, the Japanese emperor was in the middle of a series of conflicts, both domestic and international. Within Japan, the noble yet tragic Satsuma Rebellion of 1877 had been a fierce reminder of how much Japan was losing as it moved forward into modernity. From samurai Takanori Saigo's last stand, Meiji felt immense pressure to make Japan into a powerful force without losing sight of its roots. Another headache for Emperor Meiji originated in treaties negotiated in the years after the arrival of U.S. Commodore Matthew Perry and his black ships in 1853 to open Japan to trade. With the U.S., Britain, Russia, the Netherlands and France; Japan had been pushed toward signing lopsided treaties due mainly to their inability to be victorious in a head-to-head war. With a stroke of the pen, Japan lost its ability to control its own tariff rates and also punish outsiders who were economically breaking the law within its borders. The largest pain for the young Meiji, however, stemmed from his conflict with China regarding the Ryukyu Islands. Knowing Grant would be arriving in Japan, Emperor Meiji arranged to meet the general for the first time on July 4th, Independence Day in the United States. Ever since his presidency had ended two years previous, Grant and his wife had been traveling the world. It had been one of their lifelong dreams and Japan would be the last country they'd visit before returning home. When Grant's USS Richmond sailed into Nagasaki on June 21, he was formally greeted by local officials and given a 21-gun salute. The governor of Nagasaki then directed Mr and Mrs Grant to a nearby park, where they planted two banyan trees. Said Grant at the time: "I hope that both trees may prosper, grow large, live long, and in their growth, prosperity and long life be emblematic of the future of Japan." Grant's demeanor was a breath of fresh air for the Japanese people. Humble, respectful and modest, Grant didn't match the image of the common Western stereotype of arrogant, disrespectful and crude. One Japanese woman who saw him up close remarked: "He looked more like an Oriental man than an American gentleman. Because the General's appearance fit our ideal, our sense of respect of him increased." It may have also helped that he was in awe of Japan. Writing to a friend while visiting, Grant couldn't help but gush about how far the country had come in such a short time despite facing treaty restrictions and division within: "The progress they have made in the last 12 years is almost incredible. They have now Military and Naval Academies, Colleges, Engineering schools, schools of science and free schools, for male and female, as thoroughly organized and on as high a basis of instruction, as any country in the world. Travel in the interior is as safe for an unarmed unprotected foreigner as it is in the New England States. Much safer from extortion." After a luxurious "fifty-course-meal" in Nagasaki, Grant and his wife hopped back onto the USS Richmond as it made its way to Yokohama. They'd previously hoped to visit Hyogo, Nara, Kyoto and Osaka, but an outbreak of cholera in this region had left Japanese officials worried. They asked Grant not to stop. The general — once again behaving in a manner opposite Japan's Western stereotype — took their advice and they docked at a port in Yokohama on July 3. One day later, Grant stood inside the Imperial Palace before Emperor Meiji. According to scholar Richard T Chang’s groundbreaking paper published in Sophia University’s Monumenta Nipponica, the emperor, perhaps nervous, "rather stiffly welcomed the General… and congratulated him on the anniversary of American independence." "Your Majesty: I am very grateful for the welcome you accord me here today, and for the great kindness with which I have been received, ever since I came to Japan, by the government and your people. I recognize in this a feeling of friendship toward my country. I can assure you that this feeling is reciprocated by the United States; that our people, without regard to party, take the deepest interest in all that concerns Japan, and have the warmest wishes for her welfare. I am happy to be able to express that sentiment. America is your next neighbor, and will always give Japan sympathy and support in her efforts to advance. I again thank your Majesty for your hospitality, and wish you a long and happy reign, and for your people prosperity and independence." As the days passed, Grant and the emperor grew to trust each other. 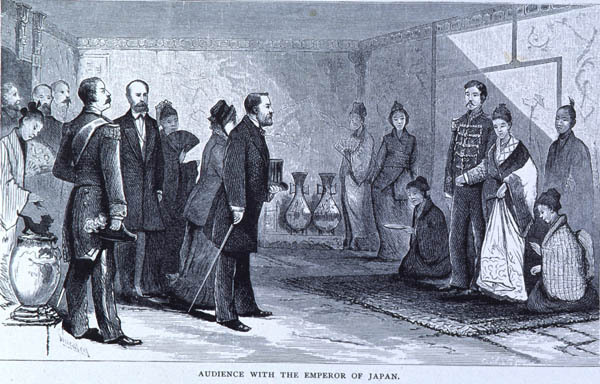 On July 7, after breakfast at the Shiba Palace with "two princes and their wives, twenty govt leaders and ten foreign envoys," the emperor took Grant to a military demonstration of the Japanese army, the general offering advice and guidance. The next day, Grant met with an old Japanese friend and colleague from the U.S., Tomomi Iwakura, and the two of them had lunch and watched a Noh play. On July 16, Grant watched a play at Tokyo’s Shintomi-za, the story being a representation of incidents straight from Grant’s life interpreted through the character of the 11th century warrior Minamoto Yoshiie. By early August, Grant wrote to a friend back in the U.S. about his experience: "My visit to Japan has been the most pleasant of all my travels. The country is beautifully cultivated, the scenery is grand, and the people, from the highest to the lowest, the most kindly and the most cleanly in the world." The most pressing matter, however, was the Ryukyu conflict between China and Japan, and starting in mid-July, Grant gave it his highest priority. In order to prepare his advice for the Emperor, Grant stayed at an inn in Nikko from July 17 to July 31, needing a bit of peace and quiet so he could read and educate himself on the complicated dispute. From the 14th to 17th centuries, the Ryukyu Kingdom (the chain of islands stretching from just below Kagoshima to east of Taiwan) had remained in a state of dual ownership by China, especially early on, and then Japan. As of the summer of 1879, Japan had grown irritated by China’s (according to Chang) “moralistic” tone, which came off as “intimidatory and insolent,” not to mention patronizing. To Emperor Meiji, the Ryukyu Islands were Japan’s and the lack of emphasis China had been placing on the islands (they were busy pushing Russia off its western border) was evidence that they could not justifiably lay claim to them. This assumption of ownership caused Emperor Meiji to go ahead with plans to declare Okinawa a bonafide prefecture in April 1879, two months before Grant’s arrival. This — to put it simply — angered China and when Grant, now nothing more than a regular citizen, visited Prince Kung and his officials in Shanghai, they hoped the former president could help bring Japan to some sort of middle ground. After a famed Nikko Conference on July 22, where Grant mentioned his strategy to the emperor’s Imperial envoy (who emphasized to Grant that Japan had zero intention of compromising), Grant continued to refine his points and on Aug 10 came back to the Imperial Palace to meet with Emperor Meiji. Grant had come up with a common-ground solution — to have both countries set up independent commissions. He expressed his potential resolution with his trademark modesty, saying “I have heard it suggested, but I have no authority to speak on the subject, that a boundary running between the Ryukyu Islands so as to give China a wide channel to the Pacific would be accepted.” As Meiji listened intently, Grant continued. The emperor, meanwhile, marveled at Grant and used the time he had with the general to address other matters that had brought him stress. At the time, Meiji was deciding whether to form an “elective assembly” or a government “that rests on the people.” Here, Grant strongly urged caution, because the moment you hand “suffrage and representation” to the population, you “give [it to] them forever,” and can never take them back. Without question, Grant recalled his decisions as president during American post-civil war Reconstruction, as he attempted to support the entry of millions of now-free black slaves into society. Here he also confessed a profound regret — and that was not stripping “old slaveholders” of their authority over the Electoral College. 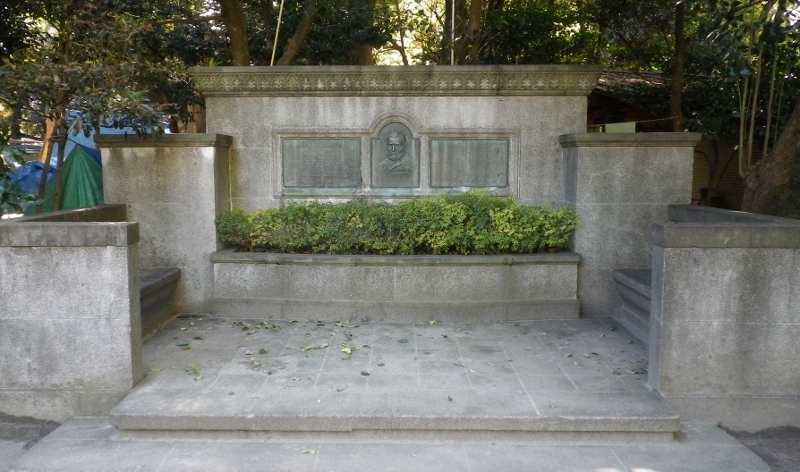 Before leaving Japan, Grant and his wife were given an extravagant send-off on Aug 25, 1879 at Ueno Park. As they did in Nagasaki, Mr and Mrs Grant planted trees, but these have survived the test of time. The general planted a "Lawson cypress" and his wife an “evergreen magnolia.” Fifty years later, Japanese officials crafted a monument near the now fully grown trees. For decades, President Ulysses S Grant would stand in Japan’s eyes as the embodiment of Western civilization’s best self. Although his advice regarding the Ryukyu islands was not altogether successful, he should continue to receive credit for temporarily dimming the hostility between the two countries and keeping them from war, at least until 1894. Next month, in our Japan Yesterday series, we’ll dive into author and humanitarian Helen Keller’s three visits to pre- and post-war Japan. Other stories in the Japan Yesterday series. Patrick Parr is the author of “The Seminarian: Martin Luther King Jr. Comes of Age.” His work has appeared in The Atlantic, Politico and The Boston Globe, among others. Enjoyed this piece. Grant's visit was certainly a high point in Japan/U.S. bilateral relations. Also interesting to note that Grant appointed John Bingham, Ohio Congressman to be America's Chief of Mission in Japan. (in those days title was Minister, now Ambassador) Bingham served from 1873-1885, the longest term of any American ambassador. Bingham was a major political figure of his generation: confidante of Lincoln, a prosecutor of the Lincoln assassins, deliverer of the articles of impeachment to the Senate in the trial of President Andrew Johnson and most importantly, principal author of the important sections of the 14th Amendment. The later contribution has led American constitutional scholars to call Bingham a second Madison or America's Founding Son, title of Magliocca's biography of Bingham. Bingham is pretty obscure. He gets more ink in American history books for having appointed George Armstrong Custer to West Point than he does for all his other contributions. Okinawa's tributary relation to China, hence its "semi-independent" status was simply a gateway for Japan's trade into the lucrative Chinese market. Once Japan had grown strong enough to impose its own demands and extract concessions from China, Okinawa's relevance as a "middle-man" declined. Japan declared outright annexation, following nearly 300 years of effective de facto occupation. What the author is perhaps "intentionally” omitting is the fact that Grant was called up as an Adjudicator in the Okinawa "issue". More importantly, the author does not tell the readers that the Adjudicator ruled out overwhelmingly in Japan's favour due to the fact that Okinawa was much more heavily influenced by Japan than from China. Satsuma had been in firm control since 1609. Similarly, Okinawa had been paying tribute to the Muromachi, (1336). The Shimazu clan was also in the "habit" of placing demands on the Ryukyus, during the 16 century. China's involvement was milder, consisting in cultural and scientific exchanges, as well as the traditional tributary requirement, prior to trade openings. This, in a nutshell explains why Japan had to resort to war in WW 2. It does not justify what Japan did next but certainly the openly racist policies of the Western Powers were the major contributing factor. Racist then, still racist now. "Satsuma had been in firm control since 1609. Similarly, Okinawa had been paying tribute to the Muromachi, (1336). " Correction: "Ryukyu had been paying tribute, not Okinawa"; Okinawa is the later Japanese given to the now defunct Ryukyu.